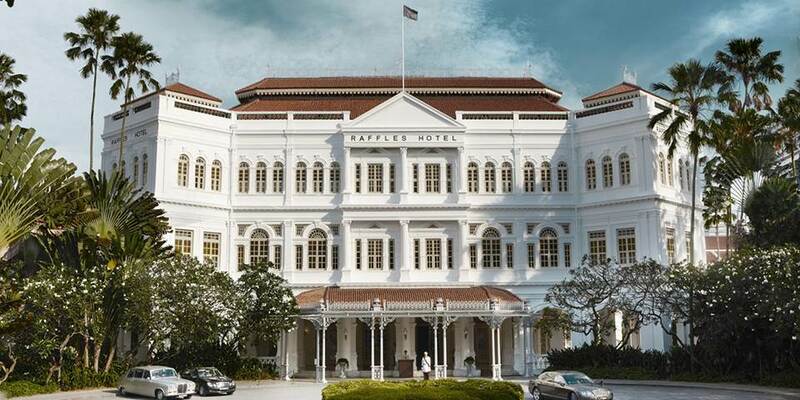 One of the world's greatest hotels, Raffles Singapore stands where it has always stood, at the crossroads of civilisation and culture, a colonial oasis in the heart of one of the world's most exciting cities. Just 20 minutes from Changi Airport and within walking distance of both the vibrant new Esplanade and the old colonial heart of the city, the story begins at the door where Raffles’ fabulous doormen, Naraja, Swaran and Sarjit, in their distinctive uniforms from Gieves and Hawkes and with huge genuine smiles of welcome, greet guests in true Raffles style. 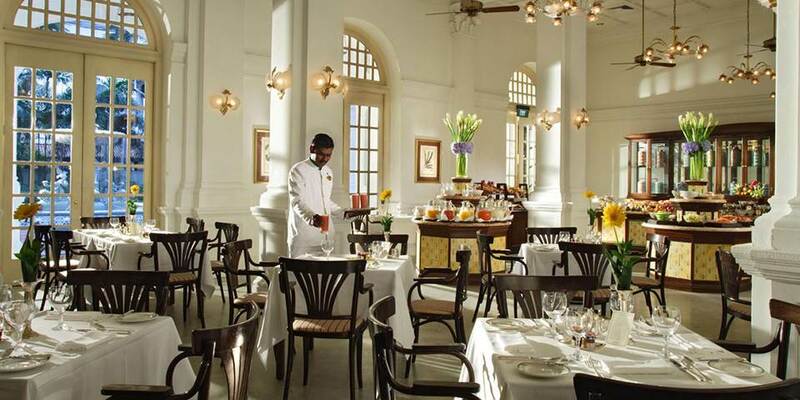 There are so many wonderful places to dine at Raffles it is hard to know where to begin: Perhaps Raffles Grill, with its aura of timeless elegance and the silver beef wagon that was buried in the Palm Court during WW II, later recovered and is still in use in the restaurant today. Beautifully restored to its former glory, with French windows overlooking the Palm Court, Raffles Grill captures the true essence of fine dining. A blend of classical and contemporary French cuisine, the menu at Raffles Grill is light and innovative, with a wine list to complement the exquisite menu. The Empire Café is a casual, cosy cross between a modern hotel coffee house and an old-fashioned kopitiam where the eclectic blend of local dishes is prepared by a team of highly specialised chefs who pride themselves on preserving Singapore’s culinary heritage. Dining at Tiffin Room is an essential experience, with the curry buffet a hot favourite with visitors and Singapore residents alike and available at both lunch and dinner. This colonial setting is also the venue for the very popular and delicious Afternoon Tea. Raffles Courtyard with its open tropical venue is the perfect place to enjoy casual dining with an Italian twist. One experience not to be missed is to have a Singapore Sling in the Long Bar. This delicious cocktail was invented in 1915 by the bartender Ngiam Tong Boonas a ladies drink, but today it is enjoyed by all. The entire hotel is filled with reminders of days gone by; from the cast iron fountain in the Palm Garden, brought from Glasgow over 100 years ago, to the grandfather clock in the airy lobby, probably the oldest piece of furniture in the hotel. Every evening, when the clock strikes eight, the lobby's pianist strikes up an old Noel Coward tune “I’ll see you again”. The hotel even has a resident historian who has been there for almost 40 years. Raffles Spa is a more recent addition and exclusively for the use of hotel guests is a haven of relaxation, with aromatherapy and Ayurveda treatments all using a natural product range, perfect after a day experiencing this amazing city. Just 103 elegant suites with every detail true to the hotel’s heritage and with 24-hour Raffles Butler service, make a stay both atmospheric and luxurious. 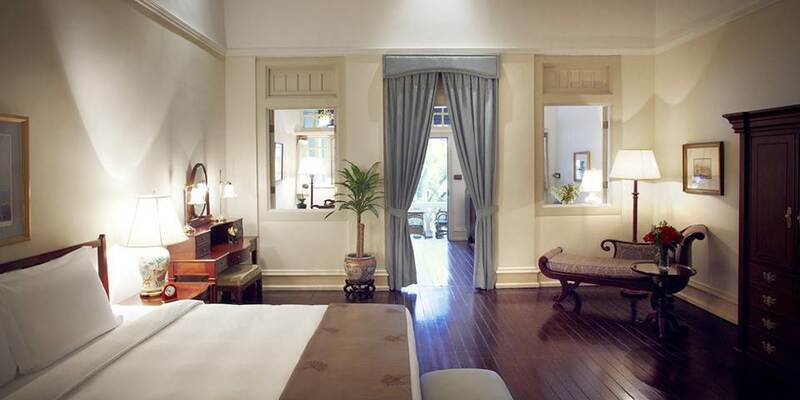 Courtyard suites are situated close to the lush flora of the hotel. 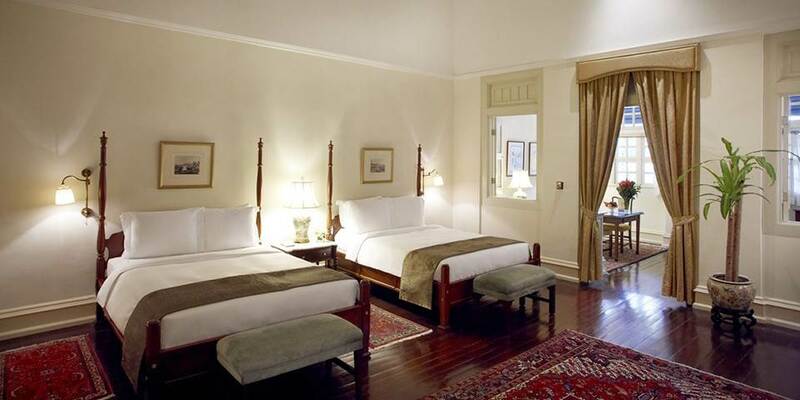 Inside each has original 14 foot ceilings, elegant period furnishings with Oriental carpets arranged on teakwood floors and is divided into four areas with a parlour and dining area leading into the bedroom and then to the dressing area and en-suite bathroom. Palm Court suites have the same luxurious interiors but border one side of the main building, with ample walkways of crushed pebbles and rows of tall palm trees lining the sides of the garden, simplicity and serenity is the order of the day here. Twelve of the suites, have been named after personalities who were associated with the hotel in its glorious past, with Ava Gardner, Noel Coward, Rudyard Kipling and Somerset Maugham to name just a few. Five Grand Hotel suites, with two bedrooms, separate parlour and private balcony are distinguished by their location in the main building of the hotel. They are spacious and elegant in design and together with the quality of the antiques and artwork; they take their inspiration from the romance of travel in a bygone age. The two Presidential suites, The Sarkies and Sir Stamford Raffles, are the largest and are distinguished not only by their fine furnishings and antiques, but also by their premier location in the main building. With each having a parlour, dining room, two bedrooms and a private balcony, they are both spacious and elegant.